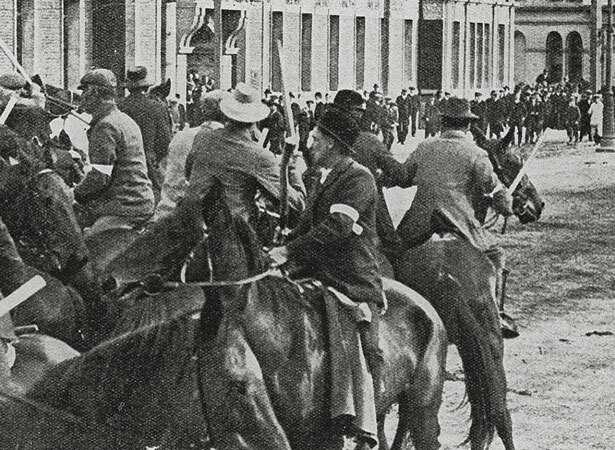 Violent clashes between unionised waterside workers and non-union labour erupted two days after Wellington’s ‘wharfies’ held a stopwork meeting in support of striking shipwrights. Employers claimed the stopwork meeting breached the watersiders’ agreement and replaced the men who attended with other (unionist) workers. The union responded by refusing to work until the dismissed men were reinstated. The employers declared that the wharfies were on strike; the wharfies claimed they had been locked out. Unionists began picketing the wharves on 23 October, and clashes broke out the following day. Negotiations between employers and union officials broke down, and unionists boarded and occupied several ships in port. The Great Strike of 1913 – a bitter two-month strike involving 16,000 unionists around the country – had begun. The dispute saw running battles between strikers and mounted special police whom the unionists dubbed ‘Massey’s Cossacks’ after Prime Minister William Massey. The collapse of the strike in December 1913 dealt the militant labour movement a severe blow, although many of the leading unionists later rose to prominence in the Labour Party. We have 9 biographies, 9 articles, related to Violence flares on Wellington wharves .